It seems that many commercial restaurants, supermarkets, and fast food stores do brine their chickens in order to make them tastier and juicier. I do not know which ones do and which do not but I am pretty sure COSTCO and Boston Markets do something to give it extra flavor. Here is to technology in action. Happy Thanksgiving to a great community! I may not post all that often (or have much to say that hasn't been said already), but I quite enjoy my time spent here. Hope everyone enjoys a wonderful holiday with family and friends! I would like to take this moment to wish everyone here a very happy Thanksgiving. I know we all have something to be thankful for and this is a special one for me. Twenty-nine years ago today, I became a father. It was one of the best days of my entire life and I am very thankful for the opportunity to guide someone into this chaotic world and witness her growth and success at reaching her potential as an adult. May all of your Thanksgivings be as blessed as mine. 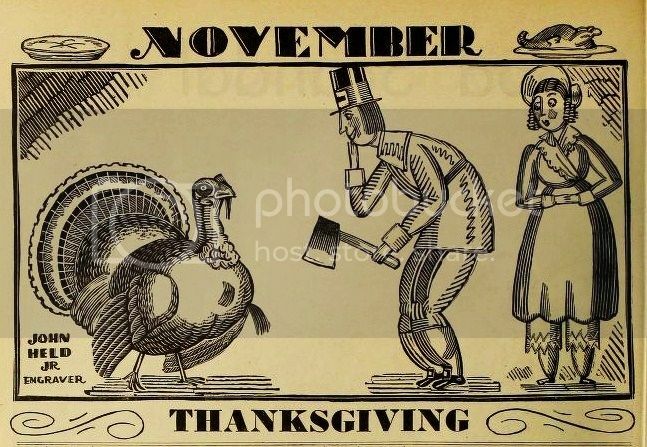 I wish everyone reading this the warmth of friendship and family, the delight of good food, and a day filled with conviviality on Thanksgiving--and everyday, really. 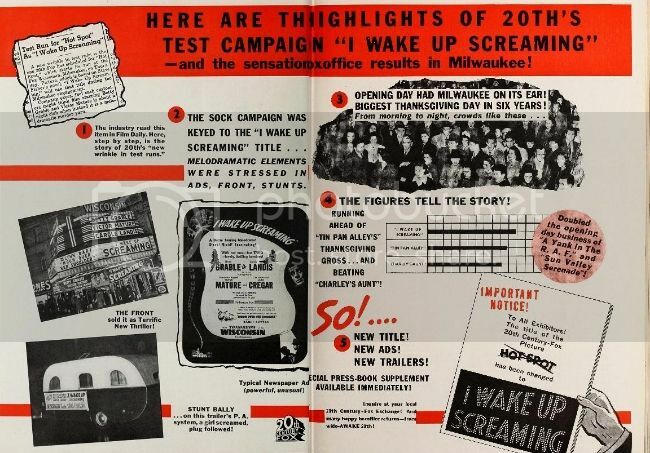 To give us some holiday cheer that is film-oriented, I have discovered some interesting advertisements aimed at theater owners preparing fare to get the crowds into their cinemas in holidays past in November. 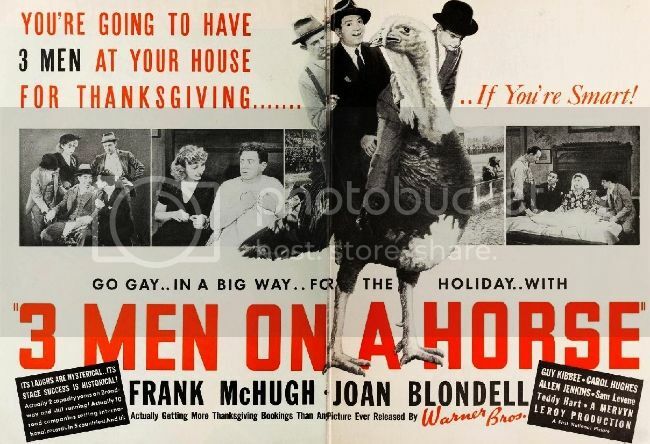 I was not able to reproduce it properly here, but my favorite discoveries were from motion picture industry magazines in which managers were encouraged "to avoid turkeys" on the screen but to drum into the staff to "use the holiday as a sales device!" 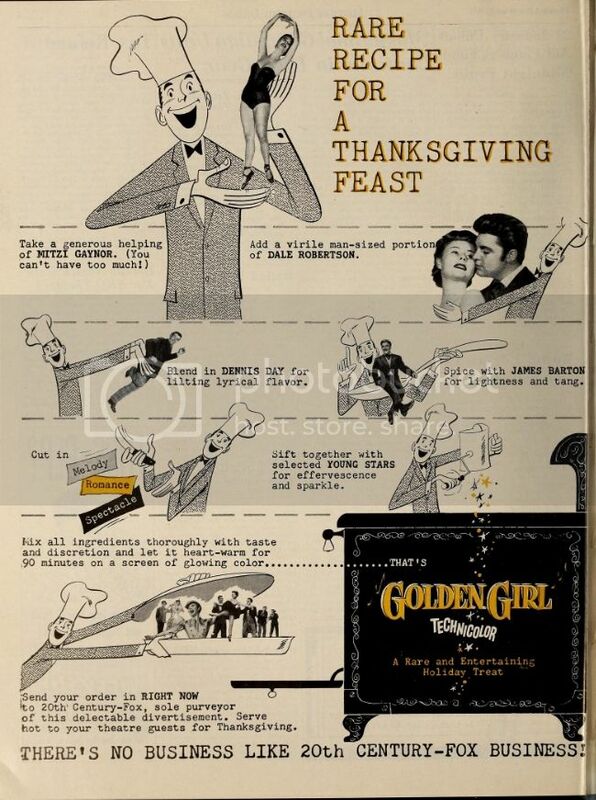 There were suggested promotions featuring live turkey giveaways ("budget how many you can afford ahead of time") whose feathers could be "dyed various festive colors." (No advice was given about where the poultry might be kept in the theater). 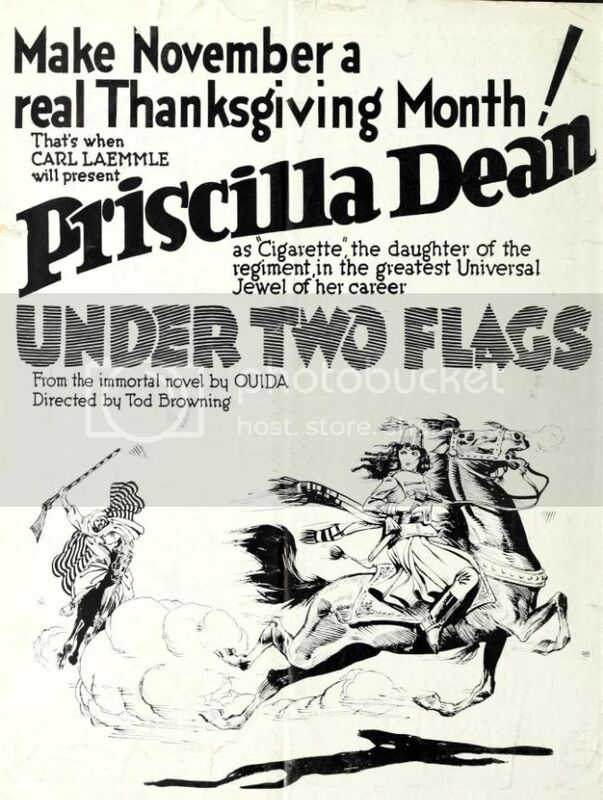 Other suggestions were similar to this one in Motion Picture Herald in 1940 in which a theater's staff was exhorted to dress in Halloween costume the month before and then to deck themselves out as Pilgrims and Indians as they served customers popcorn, took tickets, ushered guests to their seats. (Hope they were paid well, but I doubt it). 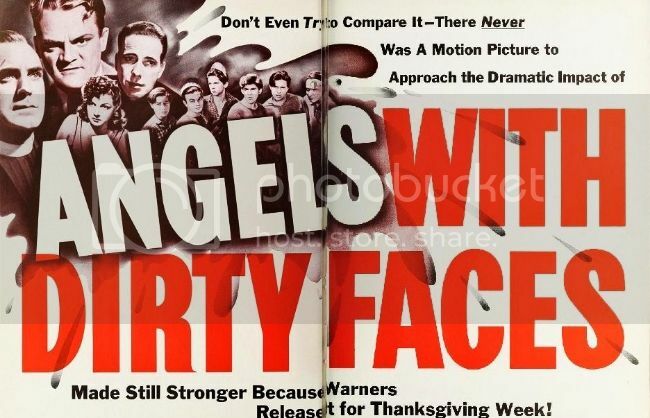 It was particularly interesting, since many of us see studio era films through an affectionate, glamorous lens, that there were some remarkably frank comments in manager's roundtables rating the business of films in their cinemas. For instance, a manager from a Hermine, PA theater commented that I Love You Again (1940) with William Powell & Myrna Loy, was a "...much heralded production fell flatter than a glass of beer left on the bar all night." I also found it amusing to see some rather grisly or non-family fare movies being promoted as holiday fare for the Thanksgiving crowd! Whoever was making up titles at Pathe in 1931 must have been a bit out of touch with the spirit of the season (and the desperation of their economically pressed clientele). 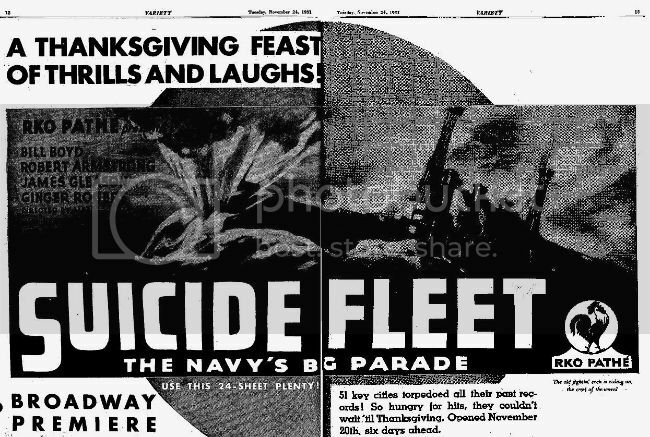 Submarine Patrol (1938) was allegedly packin' 'em in around Thanksgiving, but this now rather obscure film may be of mostly of interest to us because it was John Ford at work just before he launched into a golden period beginning with Stagecoach (1939). 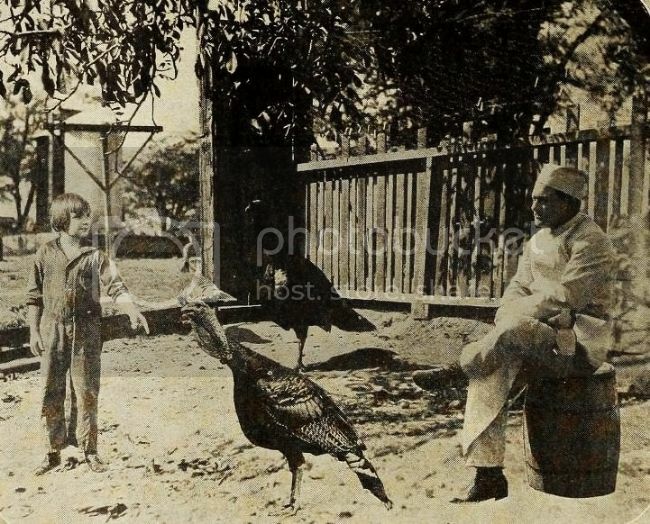 At the height of his popularity as a child actor, Jackie Coogan (1914-1984) was pictured in Exhibitors Trade Review in the mid-'20s addressing his turkey and an anonymous cook. The fawning caption for this image read "The king is to die--'Long Live the King.' 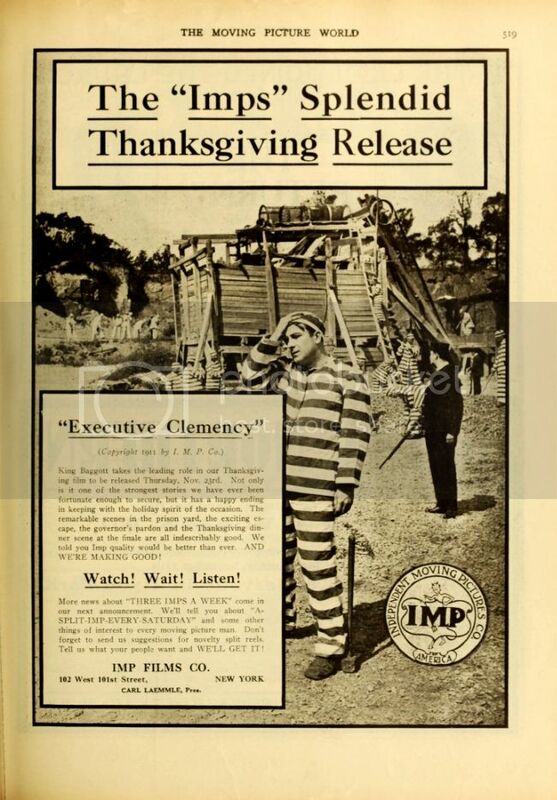 But what turkey wouldn't be glad to give his life to grace the feast of a movie king like Jackie Coogan? This one is telling the world that he considers himself lucky. In fact everyone is lucky who has had anything to do with this young star. Showmen all over the country are giving thanks because they booked his latest Metro release. 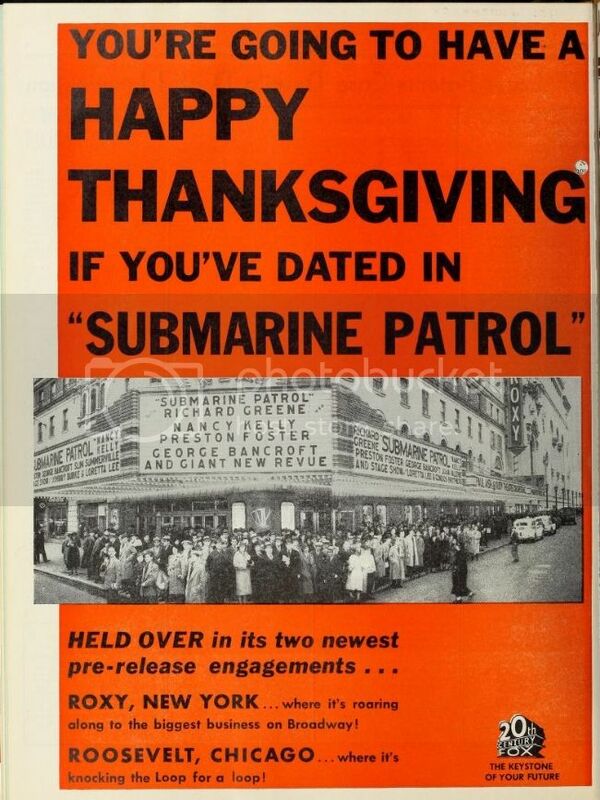 It is going to be a grand Thanksgiving." 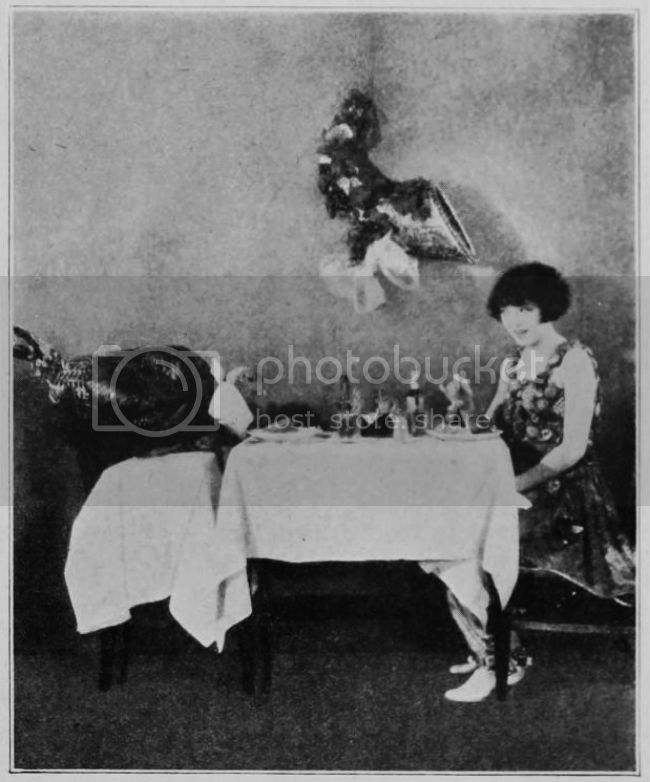 Colleen Moore (1899-1988) must have been pretty game for anything suggested by a publicity department in 1924 since she agreed to appear with this bird! 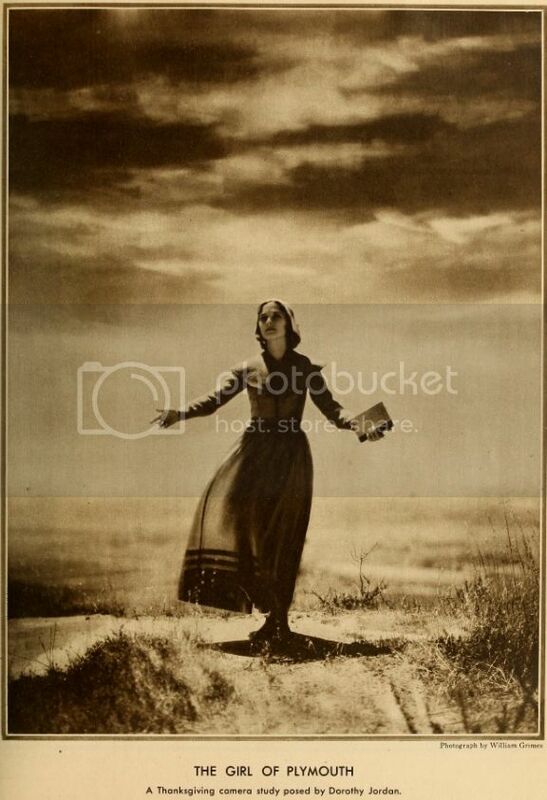 Dorothy Jordan (1906-1988) is pictured in a Photoplay image for Thanksgiving in the late '20s...I wonder if Lillian Gish's name was sewn into those pilgrim duds? Let me also thank you, Moira, for brightening the Holiday with humor suitable to the SSO. A little family-oriented bit of Holiday Cheer and Good Tidings of Joy from a very famous novel, both entitled Peyton Place. 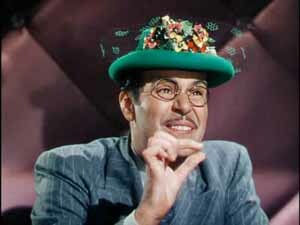 And let me join in wishing all a Happy Bird Day! Moira, thank you for sharing those wonderful advertisements! They provided my first chuckle of the day! I hope everyone has a wonderful holiday filled with family, friends and yummy food. We are going non-traditional this year, I am fixing Ribs Adobado (they've been marinating in a wonderful sauce for almost two days now) with pineapple salsa and roasted potatoes. But whatever your menu, here's hoping you have a wonderful time! Thanks for the kind responses, buds. Masha wrote: I may make mushrooms but I may again attempt candied yams. I completely and utterly destroyed that when I first attempted to make it. I will swear on my holy honor that I can still see the stain on the wall even although the kitchen has been painted since then. Believe me, Masha, we have all been on that trail of mistakes on the road to Thanksgiving nirvana. I could regale you for some time with the holidays when the turkey was cooked upside down with the gizzards still inside or a particularly rushed holiday when a frozen turkey was placed on our enclosed back porch to thaw quickly on an unusually warm Thanksgiving, only to rush to the door in response to some hubbub that turned out to be a raccoon and a possum fighting over our now shredded turkey (that was a good time to become a vegetarian). Masha, your slow roasted turkey sounds mouthwatering. I read a bit about that technique when contemplating approaches to the feast this year, and figured that I would have to have gotten up at 5am to have mine ready, so that wasn't happening (of course, I woke up at 5 anyway!). 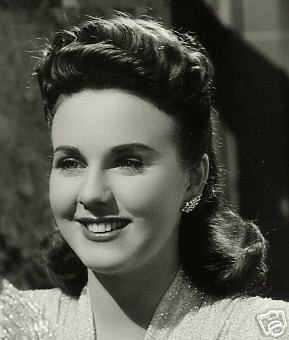 Hey, Lucky, what's not to love about the entrancing Peyton Place on Turkey Day? It's set in New England just like the Pilgrims were, wasn't it? Lzcutter wrote: We are going non-traditional this year, I am fixing Ribs Adobado (they've been marinating in a wonderful sauce for almost two days now) with pineapple salsa and roasted potatoes. Oooh, those ribs and salsa sound great. This the first year we didn't have roasted potatoes but went with garlic mashed and scalloped with spinach. (I think we will be returning to roasted for Christmas). 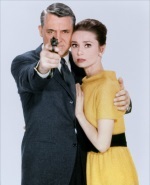 Moira wrote "Hey, Lucky, what's not to love about the entrancing Peyton Place on Turkey Day? 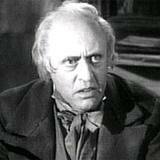 It's set in New England just like the Pilgrims were, wasn't it?" Yup, Moira. And we were responsible for the Salem Witch Trials, too.